It is widely reported that Israel had two bombs in 1967, and that Prime Minister Eshkol ordered them armed in Israel's first nuclear alert during the Six-Day War. It is also reported that, fearing defeat in the October 1973 Yom Kippur War, the Israelis assembled 13 twenty-kiloton atomic bombs. CIA estimates of the Israeli arsenal's size did not improve with time. In 1974, Duckett estimated that Israel had between ten and twenty nuclear weapons. The upper bound was derived from CIA speculation regarding the number of possible Israeli targets, and not from any specific intelligence. Because this target list was presumed to be relatively static, this remained the official American estimate until the early 1980s. Israel could potentially have produced a few dozen nuclear warheads in the period 1970-1980, and might have possessed 100 to 200 warheads by the mid-1990s. In 1986 descriptions and photographs of Israeli nuclear warheads were published in the London Sunday Times of a purported underground bomb factory. The photographs were taken by Mordechai Vanunu, a dismissed Israeli nuclear technician. His information led some experts to conclude that Israel had a stockpile of 100 to 200 nuclear devices at that time. By the late 1990s the U.S. Intelligence Community estimated that Israel possessed between 75-130 weapons, based on production estimates. The stockpile would certainly include warheads for mobile Jericho-1 and Jericho-2 missiles, as well as bombs for Israeli aircraft, and may include other tactical nuclear weapons of various types. Some published estimates even claimed that Israel might have as many as 400 nuclear weapons by the late 1990s. The Dimona nuclear reactor is the source of plutonium for Israeli nuclear weapons, and the number of nuclear weapons that could have been produced by Israel can be estimated on the basis of the power level of this reactor. Information made public in 1986 by Mordechai Vanunu indicated that at that time, weapons grade plutonium was being produced at a rate of about 40 kilograms annually. If this figure corresponded with the steady-state capacity of the entire Dimona facility, analysts suggested that the reactor might have a power level of at least 150 megawatts, about twice the power level at which is was believed to be operating around 1970. To accomodate this higher power level, analysts had suggested that Israel had constructed an enlarged cooling system. An alternative interpretation of the information supplied by Vanunu was that the reactor's power level had remained at about 75 megawatts, and that the production rate of plutonium in the early 1980s reflected a backlog of previously generated material. The upper and lower plausible limits on Israel's stockpile may be bounded by considering several variables, several of which are generic to any nuclear weapons program. The reactor may have operated an average of between 200 and 300 days annually, and produced approximately 0.9 to 1.0 grams of plutonium for each thermal megawatt day. Israel may use between 4 and 5 kilograms of plutonium per weapon [5 kilograms is a conservative estimate, and Vanunu reported that Israeli weapons used 4 kg]. Combining these variables with the highest suggested power output of the reactor -- 200 MWt -- would suggest a total stockpile of between 250 and 500 weapons by the end of 2005. And combining these variables with the suggested power level of 150MWt would yield a total stockpile of between 200 and 375 weapons by the end of 2005. The key variable that is specific to Israel is the power level of the reactor, which is variously reported to be at least 75 MWt and possibly as high as 200 MWt. High-resolution satellite imagery from Space Imaging Corporation's IKONOS satellite provided important insight this matter. The cooling towers associated with the Dimona reactor are clearly visible and identifiable in satellite imagery. 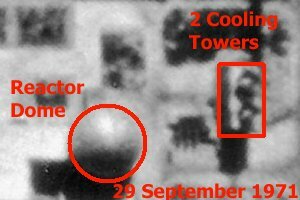 Comparison of this commercial IKONOS imagery with declassified American CORONA reconnaissance satellite imagery indicates that no new cooling towers were constructed in the years between 1971 and 2000. This suggests, but does not prove, that the reactor's power level had not been increased significantly during this period. This would suggest an annual production rate of plutonium of about 20 kilograms. 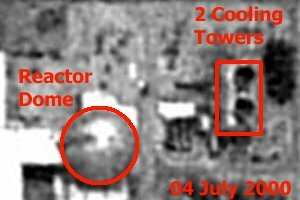 It is also possible that the Israelis increased the thermal capacity of the existing cooling towers by means that are not readily apparent in this imagery, and thus the imagery cannot positively exclude an increase in the reactor's power level and plutonium output. Based on plausible upper and lower bounds of the operating practices at the reactor, if the power of the Dimona reactor remained at 75 MWt, Israel could have produced enough plutonium for at least 100 nuclear weapons, but probably not significantly more than 200 weapons by 2005, with the stockpile growing to at least 125 but probably fewer than 250 weapons by around 2010.